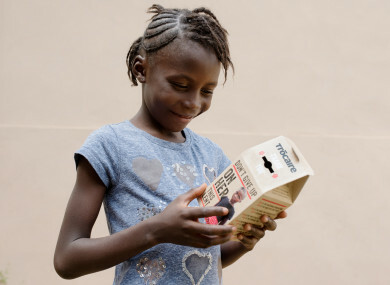 Kumba with her Trocaire box. IRELAND’S LARGEST CHARITY fundraiser, the Trocaire Box appeal, kicks off this week with one million boxes set to be delivered. The Lenten appeal saw €8.5 million donated last year, with support going to over two million people overseas. This year’s Trócaire box tells the story of Kumba, a seven-year-old girl from Sierra Leone. The campaign launches on the six-month anniversary of a devastating mudslide that destroyed her home and killed over 1,000 people in the area of Freetown where she lives. Launching the Lenten campaign, Trocaire’s Éamonn Meehan warned that growing numbers of people are being trapped in humanitarian crises. He said that Kumba’s story underlines why the charity does what it does. “At the age of just seven, Kumba has already survived an Ebola outbreak that killed 4,000 people and a mudslide that killed 1,000 people. “Her young life has been spent in an almost constant state of crisis. Tragically, she is far from alone. A seven-year-old in Syria has never known peace; a seven-year-old in Gaza has survived two separate wars; a seven-year-old in South Sudan has experienced both famine and civil war in their short life. “Conflict, climate change and disasters have led to a lost generation across so many of the countries we work in. Millions of children are growing up in the shadow of war and disaster, being moved from camp to camp; never finishing school, never knowing what it is like to have one settled home. In South Sudan, nearly 65 per cent of displaced people are under the age of 18. Soberingly, mid-way through the campaign will mark the third anniversary of the civil war in Yemen. More than 9,200 people have been killed since the Saudi-led alliance joined the Yemen war in 2015, according to the World Health Organization, triggering what the United Nations has called the world’s worst humanitarian disaster. Meehan says the conflict can and should be solved. “This is an entirely man-made crisis. Decisions made for military reasons have led to an entire civilian population facing death by starvation and disease. The decision to do this was made in Saudi Arabia and supported by many other governments, including the USA and UK. It is a war crime and it is time people were held to account for inflicting death, starvation and disease on millions of civilians. “Yemen is just one tragic example where such reprehensible tactics are being used. In Syria, South Sudan, Democratic Republic of Congo, Somalia and elsewhere civilians are deliberately attacked, denied food and subjected to sexual violence. These assaults are carried out by governments and armed groups to terrify, humiliate and oppress. Read: Why are more and more Irish charities not publishing their financial information? Email “A change collection that became an Irish institution is back”. Feedback on “A change collection that became an Irish institution is back”.